Amritsari Kulche are crisp flaky kulcha from Amritsar a city in Punjab . The flaky kulcha are made with a pastry dough and stuffed with various options . The kuchas are baked in tandoor finally finishing them off with a dollop of butter and a dash of chat masala . 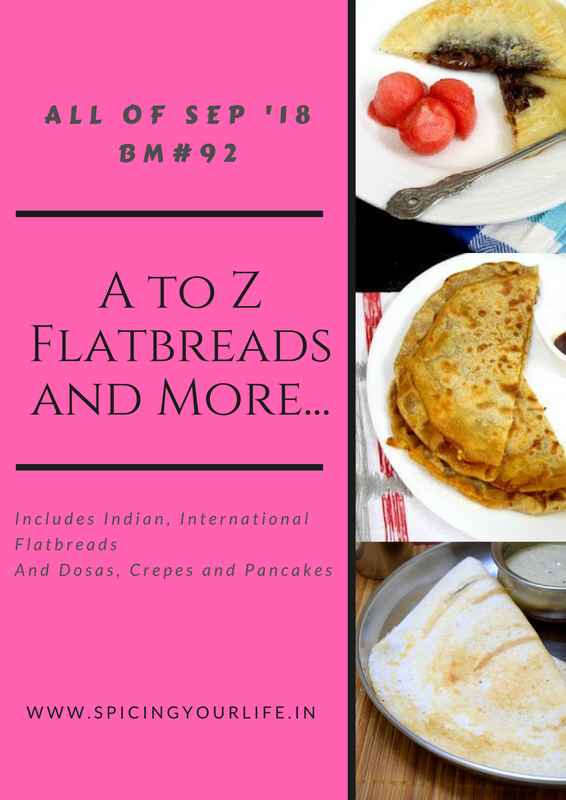 Amritsari Kulche is my first post under the theme Flatbreads and More where I shall be featuring Indian Flatbreads for the month of September. I had couple of more options for this alphabet but these Kulcha have been on my mind since long . I had posted Amritsari Aloo Paratha , and that is the time I had promised to make the pastry version of these . The Mega Marathon definitely is the perfect time for that little extra hard work , so here are these super delicious Amritsari Kulche. Amritsar is a city that I love to visit and we normally visit it every alternate year . There is something about the place that pulls you . The first pull is from the Golden Temple , you might stand in the queue for hours but yet don’t feel tiered , after the darshan one waits for the ghee loaded Kandha Prasad . The second pull is some interesting shopping , the phulkari dupattas , mojris , the papads , vadis and the masalas . Last but not the least Amritsar pulls you for absolutely delicious food it offers . It is hard for me to explain this , but truly the food in Amritsar is the best food on earth . It can be a proper restaurant or a small local joint , the food there has amazing taste . Monu de Kulche is one such joint . This place was recommended by the hotelier . The place was on the outskirts and I had to persuade hubby to take me.The road was bad and I kept getting looks from hubby .Finally we reached and ordered the kulchas which were served with chole and pyaz ki chutney and salad . The first bite and both hubby and I looked at each other and smiled and I knew what that smile meant. The complete meal was heavenly . After finishing I went up to the owner and thanked him for that delicious meal and then asked him for the recipe for the kulcha , which he kindly obliged . My hubby is such a fan of these Amritsari Kulchas that if time would permit he would fly every month to be at Monu de Kulche ! When I made these Kulchas he said “Excellent replica ! , Amritsar in Ahemdabad ! What more can I ask for “. And I thought, What more could I ask for ? So this kulcha is made with a home made pastry which is made from all purpose flour , but I substituted with half wheat flour . the stuffing could be anything like Aaloo , Gobhi , Paneer . I mixed the three as this is what we had had in Amritsar . The cholas are no onion no garlic version and are served with a nice tangy Pyaz ki Chutney . I served some Gulab Phirni as this is another specialty of the city and completed our meal . Mix both the flours in a big mixing bowl. Add sugar and salt and mix . Add ghee and mix . Gradually add milk and start kneading the dough . When the milk gets over bind the dough with water . Once the dough is kneaded cover and let rest for 15 minutes . After 15 minutes roll the dough into a big rectangle or any shape . Apply ghee on the rolled dough and sprinkle flour on it . Now fold the dough into half and cover and place in the refrigerator for 15 minutes . After 15 minutes repeat rolling and applying ghee and sprinkling flour . We shall repeat the process one more time . After this cut the dough into equal portions and make balls . Sprinkle salt over the grated cauliflower and keep aside for 10 minutes . In the meantime mix all ingredients under stuffing . Now squeeze out the grated cauliflower and mix in the stuffing mixture . In case the mixture is moist , you could add a tsp of flour . Make balls of this stuffing . Roll each ball into a disc of 4-5” . Place the stuffing ball and bring the ends together to seal . Lightly press the paratha with hands , make sure you press evenly and get a Paratha of 1/4” thickness and about 6” diameter . Pick the paratha and apply water on the bottom of the paratha . Now place the paratha , the wet side on the tawa . Reduce the flame and let the paratha cook . After 3-4 minutes , lift the tawa and invert it upside down . The top of the paratha will face the gas flame . Rotate the tawa so that it gets roasted evenly . This is an alternative to the tandoor . If you have a tandoor you can make the paratha in it . After the paratha is roasted , remove it from the tawa and check the back , if it has not cooked roast for a minute or two on flame . Once done , hold the paratha in a paper towel and crush it lightly with both hands . Apply butter lavishly and sprinkle chat masala , and the coriander cumin spice . Enjoy the hot Paratha with chole . What an amazing start to the mega BM! The whole platter looks divine. I love that flaky pastry dough you have used for the kulchas. Yum..
Vaishali I ask for you, you make a complete meal!. ..too much and love your efforts you have put in writing this post. No words to express my happiness whenever I see you showcasing new things from different places, I don’t have to take the efforts to make the trip nor wonder about the recipe as you get the recipe as well..:)…The entire setup is stunning and what a fantastic meal. Btw I am still surprised that even with your huge list you have again managed to create a whole AtoZ series again! Thanks for sharing your great recipes! Will you be posting the Chole and chutney recipes also? Thank you Nikita ! Yes will definitely post the chole and chutney recipes , though it will take a while . Who can say no to this scrumptious Amritsari kulcha and when it is presented so well… just irresistible. Ahmadabad me Amritsar…..What a great compliment and this platter truly deserves this. What a lovely recipe and amazing start to the mega marathon. Love the texture and your pictures are just so beautiful! OMG! Such an amazing setup, Vaishali. Fantastic start to the month long flatbread festival. This just proved that you can beat your own best post. Such a rich and authentic recipe. I would love to visit Amritsar. Wow, Amristari Kulche rocks and what an incredible spread there, we are already speechless Vaishali. Am sure you are take us all to a Regional trip definitely. And how wonderful that kulche looks. I dont mind having this kulche rite now. Too tempting. Vaishali, I am speechless! Am drooling over that first pic for the past 5 minutes and still can’t get over it! The kulche looks so flaky and the whole meal is so yum! I am also eyeing that Gulab Phirni! Such flaky and crispy kulchas…love the addition of cauliflower to it. Vaishali love your method of making kulcha.. they have turned out so flaky and crispy. I’ll be posting a kulcha recipe.. wish I had come across this recipe before I made mine. Oh well, next time will try your version of folding the dough with a layer of ghee. These amritsari kulche stealing my heart, I am drooling over the screen. Even my husband telling me the same. Such a great pick for the theme. Love this kulche I wish if I could get this platter. Waiting for pyaaz imli ki chutney recipe…. Both the kulcha and chutney combination made my mouth water… Please post it soon…. Send me your email , shall mail you the recipes .